"Boundary Breaks is a vineyard located on the east side of Seneca Lake in the Finger Lakes AVA of New York. In 2007, owner Bruce Murray purchased a 120-acre farm that had been in the same family since 1850. Murray's goal was to develop a vineyard that could yield Finger Lakes Rieslings that were comparable to some of the great Rieslings of Germany and Alsace. The vineyard site is exceptional. There are 70 acres of open farmland that had previously been planted to row crops like corn and soybeans. The soils are characterized as "Cazenovia Silt Loam" which is tested at an optimal pH typical of calcareous soils. These soils are considered ideal for producing complex aromatic white wines. The focus for Boundary Breaks is exclusively Riesling. There are four wines that are made in four different styles ranging from bone dry to medium sweet. The styles also utilize different clones of Riesling. 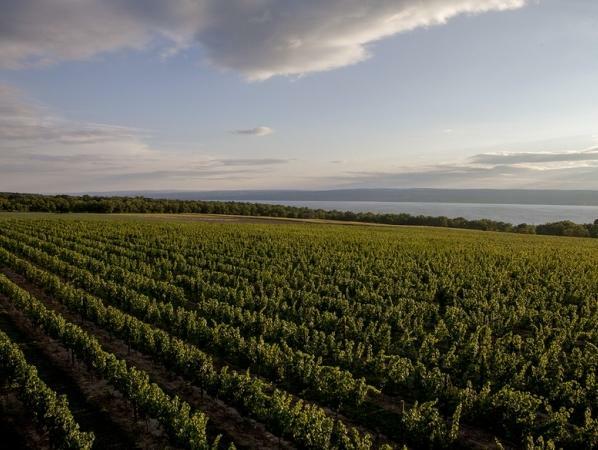 The focus and dedication of the project is a revelation in the region and one which is helping redefine the potential in the the Finger Lakes AVA." Please note this is a 375mL (wine) bottle, which is smaller than a regular 750mL bottle! Wine Advocate 89 "The 2013 Riesling "Ovid Line North" Single Vineyard is an unoaked blend of various clones with 33 grams per liter of residual sugar. This is the winery's workhorse wine, with about 2,500 cases of their total of 4,000. Yet, it is quite lovely. How can you go wrong at this price?